Flynn, unsurprisingly, turns up often in Zazzle searches. This one is targeting the “fantasy mermaid posters” searches, I’m guessing, and a quick check of Flynn’s code with View Source shows that Flynn has used alt-names, a hidden tag in HTML that tells visually handicapped users and search engines what the picture is. The alt-name helps this webpage turn up in Google searches. It’s pretty important, since image-heavy webpages don’t have a lot of text, and search engines depend on text do decide how and when to list pages in search results. Flynn also tells some mermaid stories, warming up visitors with interesting videos, polls and tidbits that will appeal to the same audience that likes mermaids. I think it’s important to have the word “Posters” in the title, as people searching specifically for posters or gifts or t-shirts are likely to be buyers, not just lookers. In this case, Flynn didn’t use a “buy” button, but it’s pretty obvious from the page title and layout that the pictures (which are a little oversized to grab reader attention) link to a place where they can be purchased. I mention this lens not to pick on the unlucky lensmaster, but to note just how tricky it is to get traffic to a “selling stuff” webpage. It’s hard to get traffic. It’s even harder to get people to buy. This lens misses two opportunities: the lens title doesn’t make it clear what the page is about (gifts with Squirrel designs), and the url is zazzle47, which doesn’t give search engines the foggiest notion what the page is about (except: “zazzle”. But there’s millions of webpages about Zazzle). 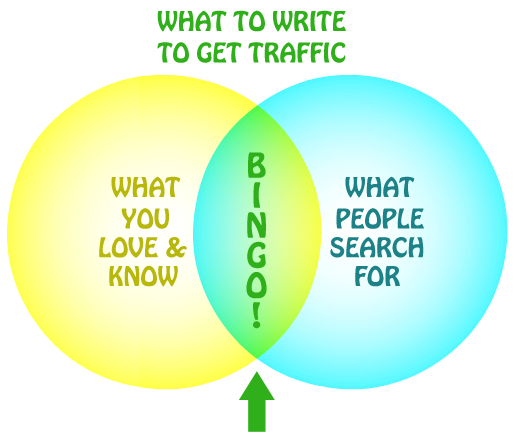 Trial and error, and checking traffic stats on high-traffic lenses, will give you clues about what you write on that people actually look for. Pippiphooray has a great eye for interesting posters, and again, the large graphics (I suspect) may work to draw the visitor. Posters are large, in real life, so this lens showcases them in all their big, bold and dramatic glory. This works well for posters, artwork, and photos, I think. My hunch is that t-shirts are better shown in a side-by-side gallery and not quite as large, since the art/words aren’t as intricate and complex. Again, since the page title has the word “posters,” it gets search traffic, and it’s reasonably clear that one can click on the posters to buy them. (as opposed to using the “buy” button I tend to add.) I’m curious whether or not Zazzle has enough name recognition to be included in many websearches — one might try an experiment with and without the word Zazzle (as Flynn is doing, sneaky Flynn) to see whether it helps or not. I suspect this lens is running into a problem I mentioned in my previous post: you can make a great lens, but if the things you’re featuring are easy to find on Zazzle, Amazon, or other e-tailer website, most visitors will just go straight to the merchant’s site and do the search there. (Zazzle has a ratings system, so the best images…sometimes…turn up first. Also, this is a tough page for SEO. “Best Art Posters” is a pretty broad search, and it turns up 93 million webpages. I’d be shocked if you could get a Squidoo lens to the top of Google for such a search, even if you used it for the URL instead of the non-seo-friendly “pippiphooray”. And the posters themselves are unrelated, so there’s not an overall page theme to help this page zero in on a few searches. The url for this lens is http://www.squidoo.com/cards-mothers-day. It uses a trick I’ve used when a keyword I want has been taken: reverse the order of the words in the URL. (But remember, you’ll then be competing with the other lens using those keywords, so you’d better make sure yours is really good!) “Mother’s Day Cards” is a really competitive search phrase, but demand is high. This lens also approaches the target from multiple angles, including videos. I like the fact that it starts off with a side-by-side gallery of six cards, enough to fit on a laptop or even mobile device screen, as soon after the introduction as possible, to get people right to what they’re looking for. They can keep scrolling if they don’t see one they like there, but by the time they’ve read those six cards, visitors have transitioned from “Is this a page I want to read?” t0 hunter-gatherer mode, finding a design that suits. This lens is clicking on all cylinders. The title and the URL zero in on a specific search, the Zazzle gallery images are big and bold (shown in sets of four, each set matching each other visually with color), the lens jumps right into the first Zazzle gallery as quickly as possible to turn the visitor from a new arrival to a window shopper, there’s enough other text to keep it from being just pictures, and this lensmaster has even used my trick of “check the fine print.” There’s a diagram of a special ipad case that includes some text pointing out features of the case, but the resolution is just a little too small to see. Some visitors are liable to click that picture to go to Amazon and see what the features are. I can’t see what kind of sales these lenses are making, so I could be totally wrong about what they’ve got going for them. But at least they’re getting traffic. My own motto is, “Traffic isn’t everything, but everything comes from traffic.” You can’t get clickouts or sales without traffic! You can use lenses to sell Zazzle designs and get commissions, but the focus of the lens doesn’t have to be on “here’s some designs.” You can also just write on a topic you like and incorporate a few beautiful, apt, or eye-catching designs into your lens on the principle that some people will click, and you might as well give yourself an opportunity to net a referral (or, at the least, a clickout). I make over $50 a month at zazzle as a yearly average, by just adding cool products to all my lenses. As in Amazon, not everyone has heard of zazzle, and sometimes they buy other stuff when they get there. I love Zazzle, they pay faster than Allposters. :) I also have my own products there, but most of my sales are referrals on others’ products. I have used Zazzle products on my lenses where appropriate but I have never made a page to specifically showcase their products – currently I have been promoting CafePress stuff for a specific niche and have been very pleased with the results. And that is where I think we have the potential for success – both CafePress and Zazzle sell officially licensed merchandise that you cannot get elsewhere. However, what would be interesting is if the Lensmasters who own these lenses would actually be willing to say how much of their traffic actually converts to sales, because as we know its not the actual number of visits, it is the conversions. So 20 visits a week that result in 10 sales may result in more income than 200 visits that result in 5 – in both cases the lens will probably rank in Tier 3 so it will be the sales that make the difference in income not the tier payments. But the most pertinent point I think you are making Ellen is about the keywords – it frustrates the heck out of me that the people in the position to influence and who people naturally will listen to the most, are missing the whole point about keywords, particularly in lens titles. We are being encouraged to use catchy lens titles etc. Heh, the mermaid one used to be a page break lens and did worse after those went. Still it gets lots of clickouts. Sales are rare, at least of stuff I feature there, but I’m pretty sure it’s responsible for other referrals! (Maybe five sales a year? Enough to be worth it, not enough to be ‘Successful’). The narwhals one is a lot more recent, and does a bit better (maybe a sale a month), but it tends not to get as much traffic. And thank you for the compliment on the picture I should dig that sketch out and finish it properly. It’s also not got Zazzle in the title because I feature stuff from Cafepress and Amazon too, and I don’t think people see Zazzle as an automatic ‘yes, buy from them!’ place yet (also because there are so many ‘awesome Zazzle lens that is actually just my stuff cause someone told me to do this’ lenses out there that I try and not look like those). I couldn’t do that with the mermaid one because mermaid posters was a huge topic, while narwhal t-shirts is a bit more specific. I will say that MY narwhal t-shirt is one of my best sellers now, not sure if that lens is responsible or not! My most successful Zazzle lens, I think, is the Gaudi Christmas Tree Ornaments one; highly, highly seasonal, but delightfully niche, so I pulled in most of the traffic on that topic (never more than 50 hits a week). And of course, many of the ornaments are my mother’s – I was trying to promote them, as I already knew they sold well (sold about 20 ornaments in a month, half of which were hers; as they are pricey, the commission was definitely worth it). I did one on Rapunzel posters; Zazzle and Amazon. Sold mostly Amazon ones, but the Zazzle posters were more interesting and attracted more traffic/clickouts. It’s fallen now, but it did pretty well for a while on visits and clickouts and picked up a few commissions. I tend to make much steadier money with the lensrank; they pull in image traffic and encourage clickouts, but the sporadic commissions can range from tiny to quite large. And looking over my referral history, all my referrals pretty much are via Squidoo, and the ‘Zazzle lenses’ are a chunk of them. I actually started out making image collection lenses from DeviantART – originally for ArtRage (which is what really got me started on Squidoo) – of little thumbnails, for ease of finding artists. That transferred very well over to Zazzle (though obviously I got a lot better at it as I went along). Basically: 1. Go NICHE. Like every other picture or product or link lens, find a corner that needs organising, ferret out all the relevant items and make them look good. 2. Image traffic matters. 3. If there are alternatives on other sites, find them. If the lens is too big, then you need to focus in a bit more tightly, whether by product type or subject matter. 4. Move on, build more. 5. Don’t limit yourself to certain ways of selling Zazzle stuff. I suspect my random art scattered across all my other lenses is responsible for as many referrals as the specific nichey image collections. Oh, if you saw my ‘Zazzle Sales & Earnings’ lens (which really, really needs updating!) there’s a graph …. we’ll see if this works. Probably not. But the referrals REALLY kicked off after I started linking from all over Squidoo. So while any single lens may not become a magic, obvious seller, they do add up. It helps that the cookie lasts so long. Thanks for the detailed feedback on what’s working for you! ETA: Wow, I’m not surprised your Gaudi Christmas Ornaments lens is doing well; it’s a very visually appealing lens. The only trick is “will people search for it?” but, evidently, they do!